Tiger Woods PGA Tour 10 (Sony PlayStation 2, 2009 - Brand New!!!! 4 out of 5 stars - Tiger Woods PGA Tour 10 (Sony PlayStation 2, 2009 - Brand New!!!! 18 product ratings18 product ratings - Tiger Woods PGA Tour 10 (Sony PlayStation 2, 2009 - Brand New!!!! The item includes : disc, artwork cover,original case, and instruction booklet. THE ITEM YOU SEE ON PICTURES IS THE ACTUAL ITEM YOU WILL RECEIVE. TIGER WOODS PGA TOUR 10. Sony PlayStation 2 20 09 -PAL-. Platform: Sony PlayStation 2. Trending at C $18.09eBay determines this price through a machine-learned model of the product's sale prices within the last 90 days. Condition is Acceptable. Disc does have scratches. 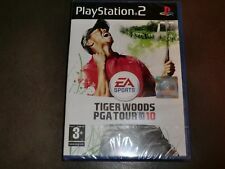 Tiger Woods PGA Tour 10 (Sony PlayStation 2, 2009). Condition is Good. Shipped with USPS First Class Package. Some wear on the disc but overall good condition. TIGER WOODS PGA TOUR 10. Tiger Woods PGA 10 (Playstation 2). Title:Tiger Woods PGA 10 (Playstation 2). All of our paper waste is recycled within the UK and turned into corrugated cardboard. Your item will be previously owned but still in great condition.